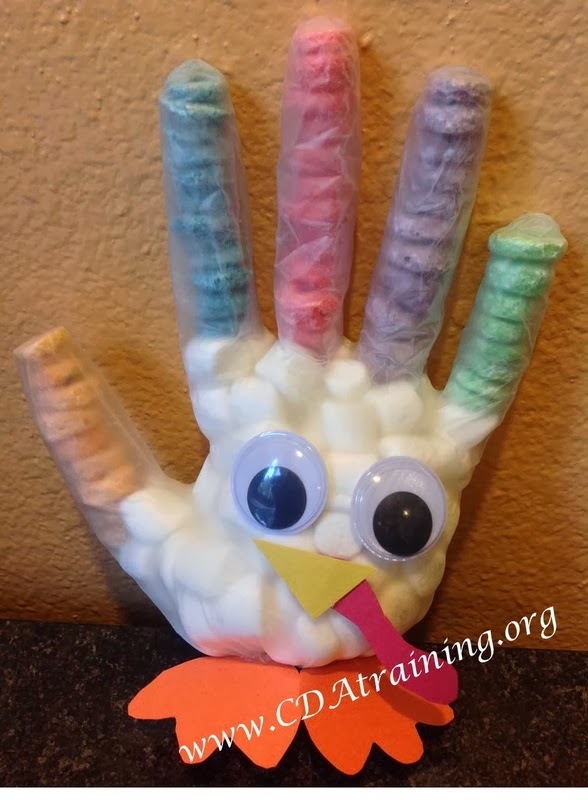 Supplies Needed; Clear Rubber Glove (be conscientious of latex allergies and use only non-powder coated), Fruit Loops, mini marshmallows, yellow construction paper, red construction paper, orange construction paper, two wiggly eyes, glue, scissors, and a rubber band. Directions; Fill fingers of the glove with colored fruit loops. Fill the rest of the glove with mini marshmallows. Tie off the bottom of the glove with the rubber band, and cut off any excess glove. Cut out feet from the orange construction paper, a beak from the yellow construction paper, and a gobbler from the red construction paper (see below). Glue on eyes, gobbler, beak and feet. Allow to dry.